Documented here is the relocation of residential buildings that were in the Hospital expansion area bounded by Tejon Street and Nevada Avenue on the west and east, and Madison Street and Jackson Street on the south and north. A recent "A look back" article in the Gazette* showing a 1956 aerial photo of the pre-expansion Glockner-Penrose Hospital got me interested in how many houses were moved out of the expansion area and what happened to them, whether the relocations were a planned effort, and whether the relocations were documented in a neighborhood history. My research on the houses moved due to the Penrose Hospital Expansion is discussed on page Moved Houses Research. Links to pages showing houses moved from Penrose expansion area to destinations - Addresses & photos. 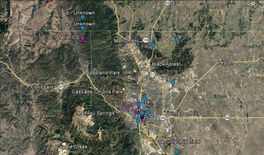 Presented on the links below is a list of from/to addresses for the relocated residences, along with my snapshots of each relocated residence, and a file photo of each residence in its original location from the El Paso County Assessor's archives. The material is organized into two web pages by streets in the Expansion area: one for north-south streets, the other for east-west streets. Of the 48 addresses in the 2-block expansion area, 25 houses are confirmed moved. See Tejon Street and Nevada Avenue: photos and notes. See Madison & Monroe Streets, and Tyler Place: photos and notes. 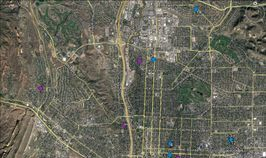 The bottom Google Earth photo is a closeup look at the distribution of relocated houses within Colorado Springs. The relocated houses marked in blue are originally from Tejon and Nevada streets, and are tagged with Numerals 1 to 14; those marked in magenta are originally from Madison, Monroe, and Tyler streets, and are tagged with Letters A through J. The Numeral and Letter tag values correspond to similar values associated with the Current Addresses in the two pages of "Addresses & photos" linked above.